We offer our clients professionally supported high altitude expeditions to major summits in the Himalayas, Africa and South America and our success is based around a highly successful 'work for locals' policy combining UK organisational skills with indigenous guides who have extensive knowledge of the terrain and weather systems on all of our expeditions. This proven formula provides our clients with world-renowned mountaineering expertise and also benefits local communities in rural and often developing regions throughout the world. We also promote responsible travel and have a 'leave no trace' policy ensuring the lowest possible environmental and social impact whilst operating in National Parks and protected regions across the globe. At Aconcagua Treks we have a real commitment to our operations and provide sustainable and environmentally responsible trekking and summit expeditions to Aconcagua Provincial Park geared around a local infrastructure with over 30 years success in the region. Our guides are chosen for their experience, reputation and good nature; qualities which leave a lasting impression on those who are guided on the demanding terrain of this region. The strength of Aconcagua Treks lies in the quality of its people, both in the UK and in Argentina. Their combined knowledge, qualifications, and experience on Aconcagua and many of the world's highest mountains ensure the highest standards of safety and a professional high altitude mountain guiding service at all times. We realise it is our clients who allow us to do what we most love to do: be in the mountains. For this reason, your trip is important to us and we want to make sure that every aspect of the experience is safe, enjoyable and satisfying. To achieve this goal we maintain the highest quality of service, with carefully organised itineraries and logistical support to ensure our clients' safety whilst also making the best use of their time and money. Our logistical services, expeditions and treks are designed to provide those on our trips with the opportunity to live out their personal goals and dreams. Our local knowledge of the finest hotels, the most reliable transportation services, and the most dependable base camp support and cargo mule outfitters in the area allows us to offer our clients a service of the highest quality, on an international level. 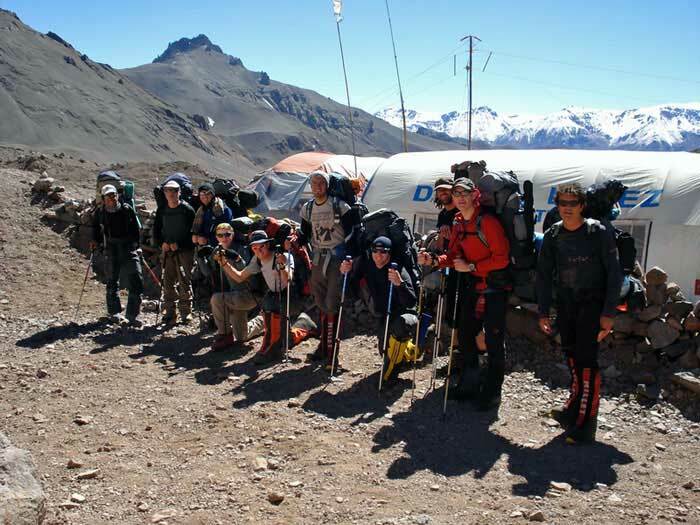 Aconcagua Treks are a UK business based in Keswick, Cumbria and offer a friendly service from your initial enquiry right through to the final preparation stage backed up by first class customer support throughout your trip. We have extensive experience of the demands of an Aconcagua summit bid and take pride in our meticulous planning and preparation which is the hallmark of our success. After more than 30 years of experience on Aconcagua our expeditions have been perfected to ensure our clients are given the highest possible chance of success in reaching the summit. However, this success does not come at the cost of the expedition members' safety. Client safety is our highest priority and our guides are all nationally certified members of the AAGPM (Argentine Association of Professional Mountain Guides), specially selected for their skill and experience. The guide to client ratio is always considered in terms of maintaining the highest safety factor possible rather than the highest profit margin. As proof of this concern over safety our guided expeditions have yet to suffer any accidents or medical emergencies over the 30 years in which we have been operating. We are familiar with each and every detail that must go into an expedition as well as all the time, hard work, and energy that our clients have invested in preparing for the climb. In this way we can satisfy the requirements of individual mountaineers and small or large groups so that every one of them can live out their dream of reaching the highest mountain in the Western Hemisphere. We offer more than just guiding and logistical support: we provide constant support and guidance throughout all the stages leading up to and during the expedition on every aspect necessary for you to reach the summit of Aconcagua (training, health, climbing techniques, etc.). Our main objective is to provide our clients with an experience rich in companionship, camaraderie and mutual respect and our goal is to be your first choice in guiding service, distinguishing ourselves by the satisfaction of our clients - a satisfaction based on the commitment and dedication of our team, the quality of our service, the responsibility we assume for our activity, as well as the image of 'Aconcagua Treks'. Why Do So Many Climbers and Professional Companies Place Their Trust in Us? We specialise in Aconcagua climbing and trekking expeditions and have many years experience of the unique terrain and weather systems on the highest trekking peak in the world. We offer a complete package providing seamless support from when you arrive in Mendoza including all necessary support services to maximise your chances of success. We believe that our expeditions rank alongside the most professionally supported climbs anywhere in the world. We offer fixed prices on guaranteed dates irrespective of group size so our clients can prepare well in advance for their expedition safe in the knowledge that it is guaranteed to run and will not be subject to additional charges in the event of a reduced group size. Our trips will always go ahead on our specified dates in accordance with our stated itineraries at our own risk. To maximise your chance of a successful ascent of Aconcagua we usually operate on a 1:3 ratio depending on the size of the group and your expedition will be organised by a bi-lingual high altitude mountain guide accompanied by experienced supporting assistants. We are Aconcagua specialists and offer the best prices in the UK. Our business is based on advance bookings on guaranteed dates at the best possible price and we regularly monitor the prices of our competitors to maintain our competitiveness in the market. Our expeditions are led by seasoned professional mountain guides who have vast experience climbing Aconcagua by a number of routes both in and out of the normal ascent season when the weather conditions are much more demanding than during the summer months. Although some organisations may discredit the quality and professionalism of local guides there is no evidence whatsoever to support this case. Moreover, we have built our reputation operating a local guides policy throughout the world and we believe there is no substitute for local knowledge. Many expeditions fail because international expedition companies hire guides who have never climbed to the summit of Aconcagua and from the onset many guides underestimate the mountain’s unique characteristics with resultant impact on the expedition. In our experience we believe that using a local guide is often fundamental to a successful summit bid. With a large part of the planet sanitised by western influence we believe that the true essence of adventure travel is to fully embrace local people and share in their rich cultural knowledge of the region. Our expeditions are focused towards the benefits derived from using experienced local staff which offers our clients the best possible support from people with specific knowledge and expertise of the cultural heritage of their homeland. If you invest your time and money into one of our Aconcagua expeditions you will be assured of a warm welcome from our staff and guides who will give you a unique insight to Argentina and the Andes. Acclimatising to the thin air at high altitude is essential for a successful ascent and our expeditions give you sufficient time to adjust also providing extra days as contingency in case of bad weather. It is vitally important to fully acclimatise and although some companies offer shorter climbs on Aconcagua, unfortunately, this is often detrimental to the expeditions chances of success. It is essential that you conserve your energy in order to reach the summit. We provide mules for the transport of equipment for the return trip from Puente del Inca to Plaza de Mulas and experienced porters to carry the group’s tents and equipment from Base Camp to the High Altitude Camps. Include four season tents, stoves, cookware, dishes and all necessary food. A healthy well balanced diet is fundamental so you will have the necessary energy for such a demanding ascent and our meals are prepared following strict standards of hygiene with high nutritional value. Our food is easy to digest with the optimum amount of carbohydrate and protein to ensure maximum performance at altitude and we can also cater for vegetarians upon request. 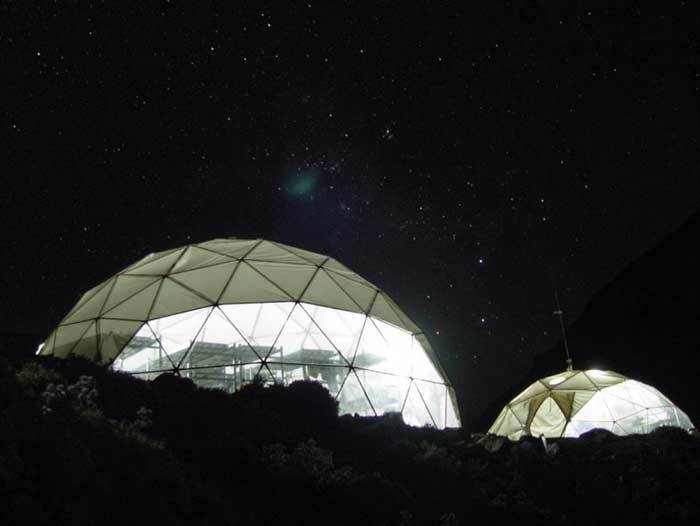 We have permanent radio communication between base camp, Mendoza and Puente del Inca so we can coordinate different logistical issues, reservations and when necessary, rescues or evacuations. Aconcagua Treks care passionately about preserving the environment and our guides and support staff living in this region constantly strive to maintain a 'zero impact' ensuring that all climbers help to minimise the effect of the expedition by removing all waste in a safe and responsible manner. For Aconcagua Treks this is not just a business - it is a way of life for our guides that benefits their families and the greater community in this region.